Water security is of paramount concern and steps will be taken to enhance it measurably for local communities. To make a comprehensive assessment of the feasibility of linking the rivers in the country, starting with the south-bound rivers. 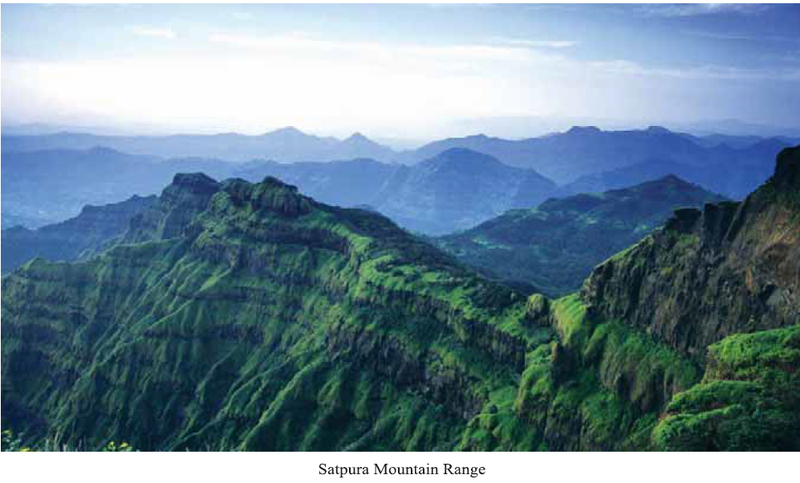 India has an enormously rich biodiversity that is under threat on account of various reasons. 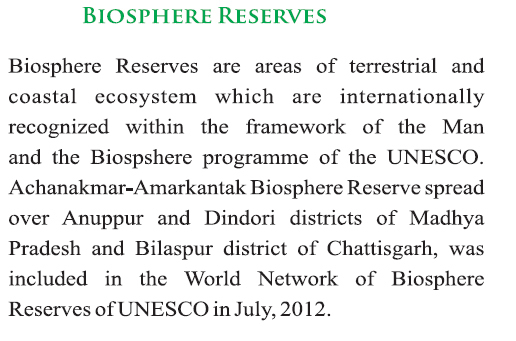 To commit itself to strengthening people’s movements whose objective will be to protect and preserve our bio-resources and ensure their sustainable use. 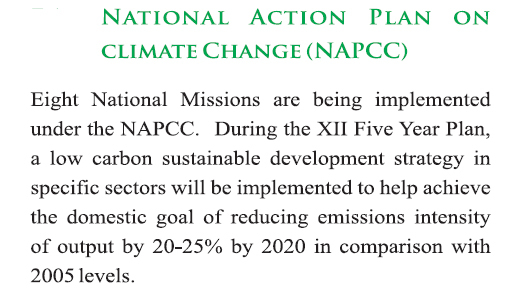 National Action Plan for Climate Change. This action plan will be implemented in letter and spirit. 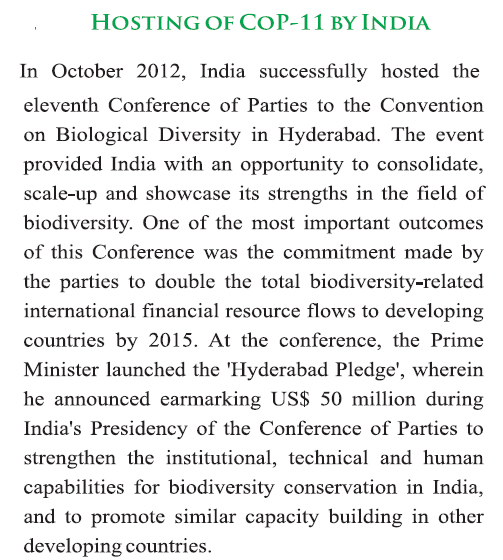 The UPA Government has adopted a new National Environment Policy to mainstream environmental concerns in development activities and policies across relevant sectors. The policy embodies a paradigm shift in that it recognises that the most secure basis for conservation is to ensure that the people dependent on a particular resource obtain better livelihoods through conservation rather than through degradation of such resource. The UPA Government has established the National Tiger Conservation Authority to strengthen tiger conservation and has set up the Wildlife Crime Control Bureau. The UPA Government has acted with urgency on the issue of climate change and set up Prime Minister’s Council on Climate Change to plan and implement appropriate strategies for mitigating and adapting to climate change. A comprehensive National Action Plan on Climate Change is under preparation. India is willing to ensure that its per capita emissions shall at no time exceed the average per capita emissions of developed countries. Under UPA-1- Under the Clean Development Mechanism, one third of projects registered globally are from India, the highest for any country. These have the potential of facilitating investments of over Rs. 71,000 crore. The Jawaharlal Nehru National Solar Mission was launched by the Prime Minister on 11th January 2010. The mission has set an ambitious target of creating a capacity of 20,000 MW grid solar power, 2000 MW off-grid solar applications and 20 million square metre of solar thermalollectors by the year 2022. One of the objectives is to reduce cost of solar power so that grid parity can be reached by the end of the mission period.Research & development activities will also be given a major boost under the mission. The Prime Minister’s Council on Climate Change has started the implementation of the National Mission for Enhanced Energy Efficiency (NMEEE). To operationalise the NMEEE, the Energy Efficiency Services Ltd. (EESL), a joint venture company, has been set up with equity investment of Rs. 190 crore by four participatingcentral public sector units. 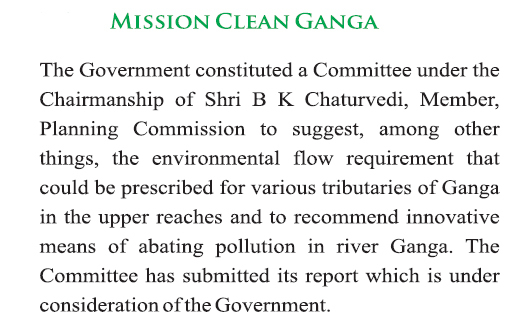 The Council has also approved “in principle” the draft mission documents of the National Mission for Sustaining the Himalayan Ecosystem and the National Mission on Strategic Knowledge on Climate Change. 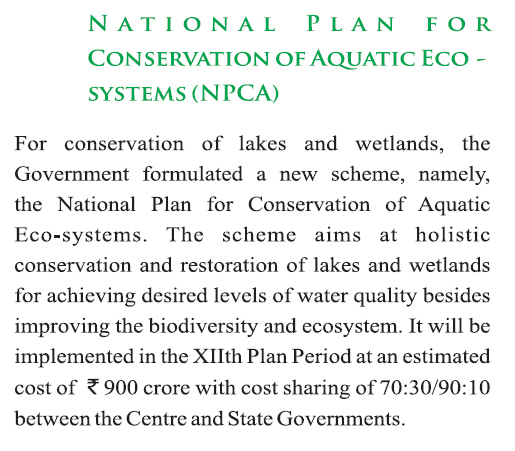 State governments have also prepared State-level Action Plans for Climate Change, consistent with the strategy outlined in the National Action Plan on Climate Change. More than Rs. 9900 crore (during previous governments) , lying unutilized in a centralized account for the development of the forestry sector, has become available for use. Instructions have been issued for the formation of State-level Compensatory Afforestation Fund Management & Planning Authorities for enabling release of 10% of the amount available in the centralized account to state governments every year.Funds have been released to most of the states.